LÂM ĐỒNG — Đà Lạt City officials, on Friday, began an investigation into the deforestation in Commune 12’s subzone 151. Two suspects being investigated are 36-year-old Đoàn Văn Dũng from Đồng Nai Province and 31-year-old Nguyễn Văn Ngọc from Thái Bình Province. 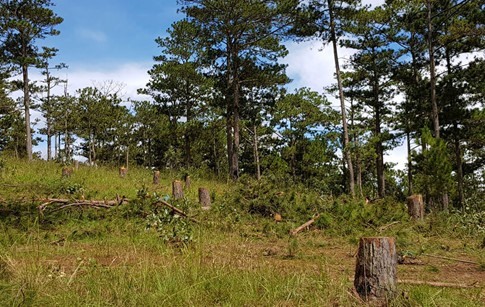 Dũng said he hired Ngọc and five others to cut down 20 pine trees in order to sell vacant land at VNĐ200 million (US$8,800) per 1,000sq.m. Those pine trees were then cut into small pieces and burnt. The destroyed forest is located near the national road connecting Đà Lạt City with Nha Trang City. Võ Thanh Sơn, head of Đà Lạt City Forest Rangers, said that they inspected the area on Wednesday and have collaborated with Đà Lạt City Police to conduct the investigation. Lâm Đồng Province People’s Committee allocated the pine forest to Đoàn Văn Dũng’s family to build the Cát Minh Ecotourism area. Since they are incapable of implementing the plan, the local authority decided to withdraw the project and hand over the land to Lâm Viên Đà Lạt Forest Management Board.